To Cite: Yazdi H R, Jamei Moayedi R, Shokrgozar M A, Dehghan M M, Mokhtari T. Evaluation of Delayed Effect of Intra-Articular Injection of Cefazolin, Gentamicin and Vancomycin on Articular Cartilage: an Experimental Study in Rabbits, Shafa Ortho J. 2014 ; 1(3):e29. Background: Antibiotics are the most common additives used in irrigation solutions for open fractures. None-the less, there have been few studies exploring the effects of antibiotics on articular cartilage. The purpose of this study was to evaluate the delayed effect of intra-articular injection of cefazolin, gentamicin and vancomycin on articular cartilage. Objectives: We proposed they may have potential toxicity on articular cartilage and this effect may be manifested as a delayed phenomenon due to changes in matrix and cell viability. Materials and Methods: A sample of 20 rabbits was chosen and assigned into 4 groups (each containing 5 animals). A course of antibiotics including gentamicin, vancomycin and cefazolin was injected in both knees of test rabbits. Normal saline was injected to controls. After 8 weeks, articular cartilage of distal femurs was harvested and analyzed using confocal microscopy and Real time PCR. Results: According to confocal microscopy results, gentamicin and vancomycin had significant decrease in live chondrocyte cell number; however, cefazolin had no effect. Conclusions: Quantitative analysis showed no significant difference between antibiotics and control group. We found that cefazolin can be safely used for intra-articular injections, but vancomycin and gentamicin should be used cautiously. The chondrocyte is a cartilage cell and a prominent tissue in the embryo acting as a template for development of skeletal elements. In adults, the distribution of permanent cartilage is much more restricted and necessary for mechanical support, growth and movement (1). The cartilage tissue is strongly related to its surrounding organic environment and particularly sensitive to small alterations in features such as oxygen saturation, heat and PH (2-6). Several studies have reported the potential toxicity of some substances on the articular cartilage (5, 7). Antibiotics are the most common additives used in irrigation solutions for open fractures (8) including open joint fractures. However, few studies have investigated the toxic effects of antibiotics on articular cartilage (9, 10). All these were in-vitro or short-term in-vivo studies without considering the potential recovery of chondrocytes. The purpose of this study was to evaluate the delayed effects of intra-articular injection of cefazolin, gentamicin and vancomycin on articular cartilage. The hypothesis, according to the characteristics of antibiotic solutions, was that they have potential toxicity on articular cartilage because of cellular damage or matrix changes and this potential toxicity occurs as a late phenomenon. We conducted an animal re-search to test this claim. Twenty male rabbits their weight varied from 1900 to 2200 g with normal appearance and activity were recruited. They were maintained in animal house at a temperature of 20 ± 2°C with 12-hour light/12-hour dark conditions one week before testing to be adapted to the environment and the climate. The rabbits were kept in metal cages with unrestricted access to food and water. The animals were divided into four groups each containing five rabbits (10 knee joints). The study protocol was approved by the local Medical Ethics Committee. Two milliliter of normal saline solution was injected into both knee joints of group one (controls), and 2mL of gentamicin (0.08 mg/mL), cefazolin (1 mg/mL) and vancomycin (1 mg/mL) to both knees of groups two, three and four separately. We used normal saline as per previous studies (5, 11) and found it to be safe for use in intra-articular procedures such as arthroscopic procedures. All injections were performed in a sterile condition by an experienced veterinarian surgeon without insulting articular damage. Prior to injection, the animals were all anesthetized by use of ketamine hydrochloride (4.0 mg/kg) and xylazine hydrochloride (0.4 mg/kg). The injection was performed from a craniolateral approach to patellar tendon. In a preliminary study in which contrast media was injected into rabbits’ knees of the same size we determined that a 2 mL injection distended the joint and it was spread throughout the knee joint equally in radio-graphs. All rabbits were sacrificed at 8 weeks using lethal doses of thiopental and then articular surface of distal femurs were harvested in sterile condition. The surface of the cartilage at the time of harvesting was smooth, glasslike and glistening. The 20 µm thickness articular cartilages of distal femurs harvested by use of microtome were placed into acridine orange for staining live cells for 10 minutes and then in propidium iodide for staining dead cells also for another 10 minutes. The samples were washed and confocal images acquired using confocal microscope (microscope: DMI 6000CS, scanner: TCS sps II, Leica, Germany). The three dimensional (3D) images were taken to determine the percentage of live and dead cells by manual image analysis. Punched cartilage pieces of freshly harvested distal femurs were preserved in a cryostat which was set at -196°C for mRNA analysis. Then by using mRNA isolation kit (RNAqueous @-Midikit-The Ambion) the process of mRNA isolation was accomplished. Using a spectrophotometer the concentration of mRNA from each sample was measured. Concentrated mRNA solutions were diluted further so that adding 1 µL of each sample’s mRNA solution would equal exactly 200 ng of that sample for a polymerase chain reaction. Prime Script RT Master Mix (Perfect Real Time) was used for cDNA synthesis. Real-time polymerase chain reaction (RT-PCR) was the method used for comparative quantitative mRNA analysis. 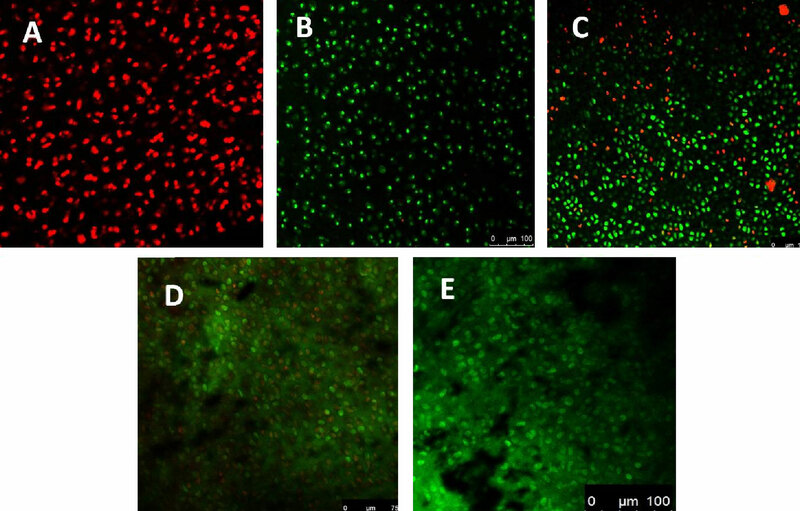 The RT-PCR was found to be the best choice for mRNA quantification in cartilage and chondrocyte culture by Mc Alinden and colleagues (12). SYBR Premix Ex Taq II (TliRNase H Plus)-TAKARA was used as Real-time Master Mix. Gene primers were obtained for the cellular metabolism-regulating transcription factor for aggrecan, collagen type 1 and collagen type 2 expressions. Normalizing was by 2-∆∆Ct method. Each reaction took about 2 hours to be completed. The changes at metabolic parameters of each antibiotic group were compared with the control group (normal saline group) by Glyceraldehyde 3-phosphate dehydrogenase (GAPDH) housekeeping gene and 2-∆∆Ct normalization method. The t-test was used for statistical analysis. P value of < 0.05 was considered as significant. In gentamicin and vancomycin groups there was a significant decrease in live cells count; (P < 0.034, P < 0.004 respectively) but we didnot observe any cell death in cefazolin group (Figure 1 and 2Table 1). By use of real-time PCR, we found no significant difference in gene expressions between various groups (Table 2, 3 and 4Figure 3). In an animal study using gross evaluation and histological scoring systems, Lescun et al. (9) stated that continuous infusion of gentamicin into the tarsocrural joint of hors-es for 5 days is an acceptable method for the treatment of septic arthritis. It was a short term study by harvesting cartilage specimens at day 14. In another study according to general and local clinical findings, again an animal study concluded that intra-articular administration of doxycycline in calves had excellent compatibility. Significant decreases in matrix metalloproteinase activity in doxycycline-treated joints may indicate a potential chondroprotective effect of doxycycline (10). In 1996, Edin ML et al. (13) performed an in-vitro study to determine the effect of cefazolin and vancomycin on osteoblast-like cells. Different concentrations of cefazolin and vancomycin at order-of-magnitude intervals between 0 and 10 mg/mL were used. Cell number and 3H-thymidine incorporation at 0, 24, and 72 hours were determined. Levels of vancomycin of 1 mg/ml and lesser had little or no effect on osteoblast replication. Concentrations of cefazolin of 0.1mg/mL and less had little or no effect on osteoblast replication and concentrations of more than 0.2 mg/mL significantly decreased the cell replication (13). This concentration of vancomycin was the same as it was in our study but we used a tenfold concentrated cefazolin. In Rathbone et al. study, osteoblasts were treated with 21 different antibiotics over 8 concentrations from 0 to 5000 µg/mL. Osteoblast deoxyribonucleic acid content and alkaline phosphatase activity (ALP) were measured to determine cell number and osteogenic activity, respectively. Gentamicin was an antibiotic that decreased cell number and ALP significantly compared to the con-trol group at drug concentrations of ≤ 0.2 mg/mL (14). In our study gentamicin concen-tration was lower (0.08 mg/mL). In an in vitro study, Antoci et al. (15) stud-ied the dosage of antibiotic which could cause reductions in osteoblast and chondro-cyte cell numbers. Vancomycin at doses greater than 2 mg/ml highly decreased cellu-lar proliferation. 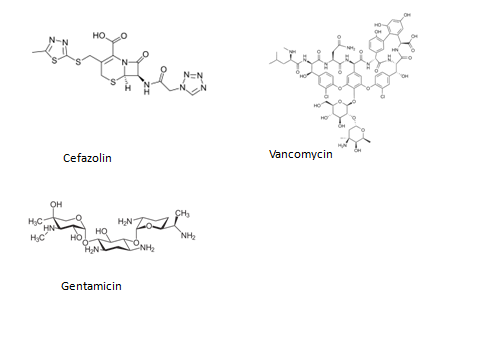 We studied molecular structure of three common antibiotics used in irrigation lavage (gentamicin, cefazolin and vancomycin) and also determined PH of these antibiotic solutions. All the antibiotic solutions had PH less than 7 (acidic). According to molecular structures, all antibiotics tend to take positive electrical alloy (Figure 4), thus all of these antibiotics are the same regarding the PH and electrical tendency. In gentamicin and vancomycin groups according to confocal microscopy results, there was a significant decrease in chondrocyte viability, but we did not find this as a significant decrease in gene expressions. To explain this finding, it seems that although these antibiotics can cause cell necrosis; this is not enough to change gene expression quantitatively. We recommend for further studies with increasing the number of the samples and expanding the time since injections to harvest of the samples to determine the exact value of gene expression. 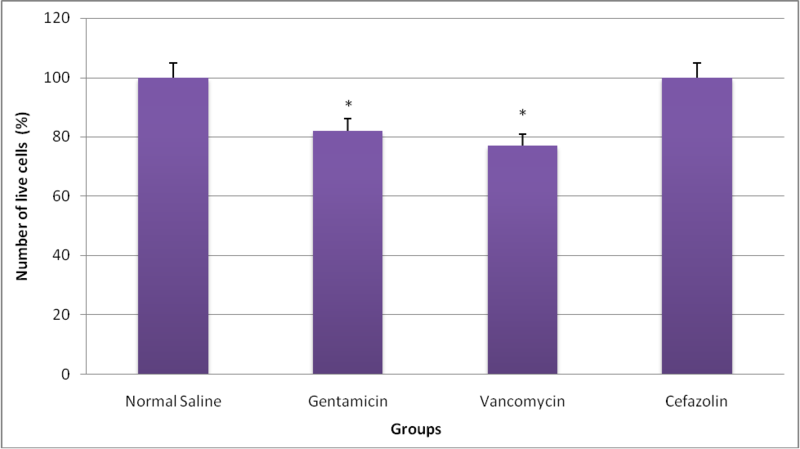 We conclude that gentamicin and vancomycin at the given doses for intra-articular cases should be used cautiously. In cefazolin group, there was neither cell death in confocal microscopy or significant decrease in gene expression compared with control group during molecular study. We conclude that cefazolin is a safe antibiotic to be used in intra-articular cases. According to our study, cefazolin can be safely used at doses equal or less than 1 mg/mL for intra-articular injections and gentamicin and vancomycin may be harmful at doses of 0.08mg/ml and 1 mg/mL, respectively. Further in vivo studies by different concentrations are needed for fine tuning the exact safe dose of these antibiotics and to balance their benefits and potential detri-mental effects.